This book helped me remind myself of what I should ACTUALLY be working towards. I've already started implementing many of the challenges listed in the book, and I once again am feeling obsessed with a couple specific areas of my life that I desperately want to improve. I feel invigorated, as if I'm now aiming towards what I should've been going after all along, and am chasing after daily discomforts and fears, trying to avoid the path of least resistance. 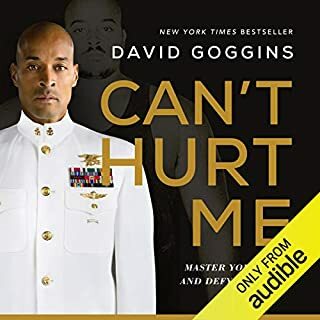 Mr. Goggins' story was emotionally moving, and the audiobook format worked great, given that, what would normally be a simple narration turned into a bit of a podcast in certain moments. I wasn't initially sure if I'd enjoy that or not, but I think it worked really nicely. It provided some tension-releasing moments of humour, and some great off-the-cuff banter back and forth at times. All in all, this book was amazing. Thank you David Goggins. Thank you very much.